Zero Zero Robotics has announced the launch of Hover Camera, the first of its kind from the company. The hover camera has unique features focusing on a durable and portable lightweight design, competitive price, and ease of the use through an iPhone app. Hover's most striking feature is its design, when folded up, it's about the size of an old VCR tape. With around a half a pound, its much light than you'd expect. The Hover Camera connects to an iOS device over direct Wi-Fi, which limits its range. The iOS app for Hover is well designed, offering simple onscreen touch controls for altitude, forward, backward, and strafing left to right. 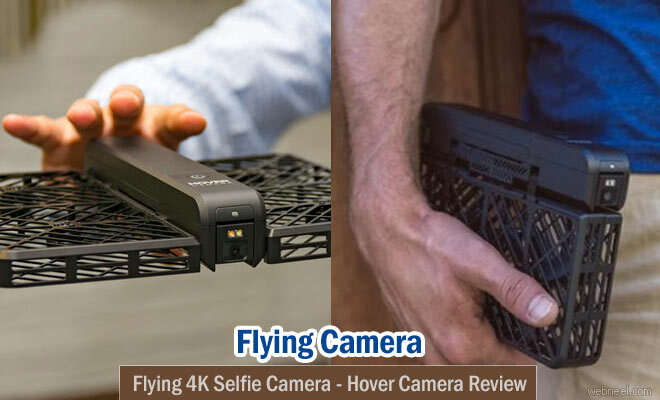 The device is capable of capturing 4K ultra-high definition video, as well as 13-megapixel images, putting it about on par with Apple's iPhone 6s lens.The Hover includes sensors on the bottom, including sonar, to measure the distance from air to ground. Hover Camera Passport can fly up to 2000 meters above sea level, in conditions without wind. You can fly Hover Camera Passport in wind speeds of up to 6mph (10kph). You can get up to 10 minutes of flying time depending on how you use Hover Camera Passport. Each sales box is shipped with 2 batteries so you’ll be able to enjoy up to 20 minutes of flight time. You might find that if you’re using it for capturing your own moments on-the-go, ten minutes goes a long way. Pricing: For the two weeks period following the launch on 13/10/2016, you can enjoy a discounted price of $549 and later the price would be $599.